Depending on your location and planting schedule, it may soon be time to start thinking about starting those seeds indoors. If you are considering trying this for the first time, here is a simple stand that you can build quickly to get things started. For the last seven years I have been starting seeds indoors with great success. 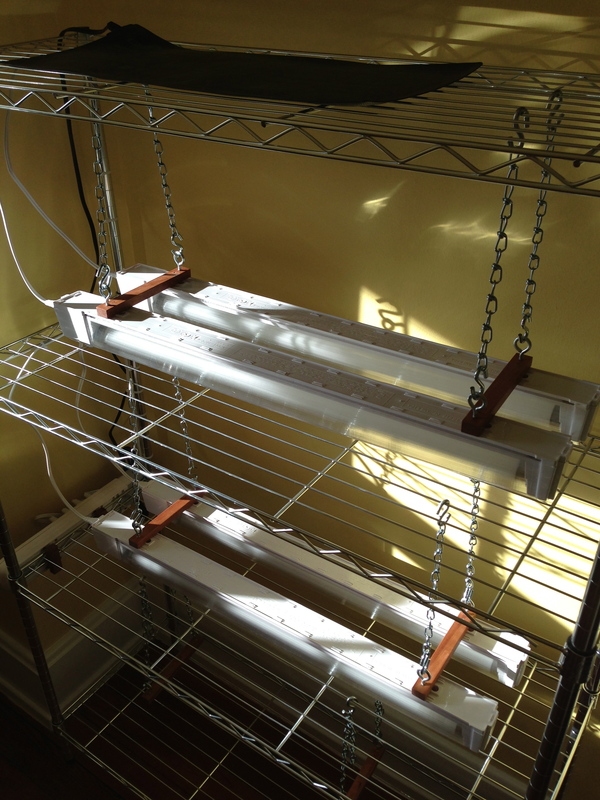 My previous seed starting set-up was one 48 inch long fluorescent light with 4 bulbs, I hung the light on an adjustable stand that I built and placed the stand on a card table. The whole thing required a large square area dedicated to seed starting. It was hard to dedicate that space for long periods of time, which made it difficult to try to start plants for a fall garden. For the last few years I have been considering a new step-up that could handle the same amount of trays, or more, but in a more compact design, that could stay in place almost all year-round and not be an eye sore (the jury is still out on that). 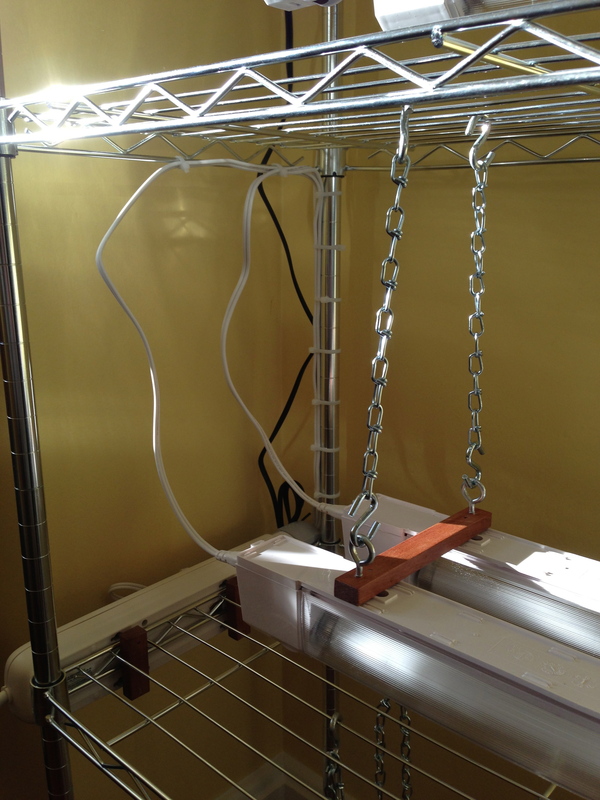 My solution is a simple, easy to build, seed starting stand. Almost all of the items used in this seed stand can be purchased at a retail location. 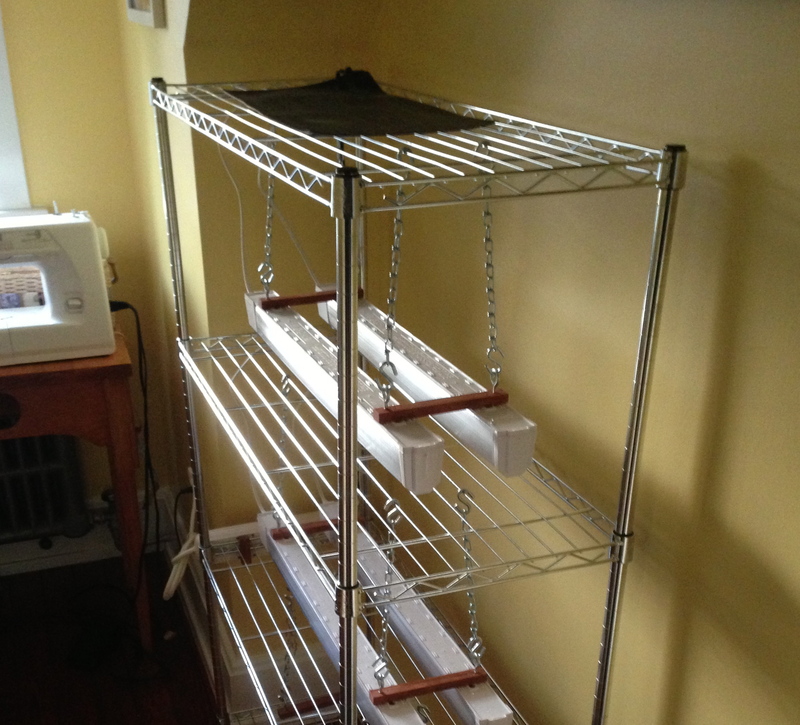 This seed starting stand begins with a wire frame shelf sold at a wide variety of retailers. It is easy to assemble and light weight, allowing it to be moved easily. 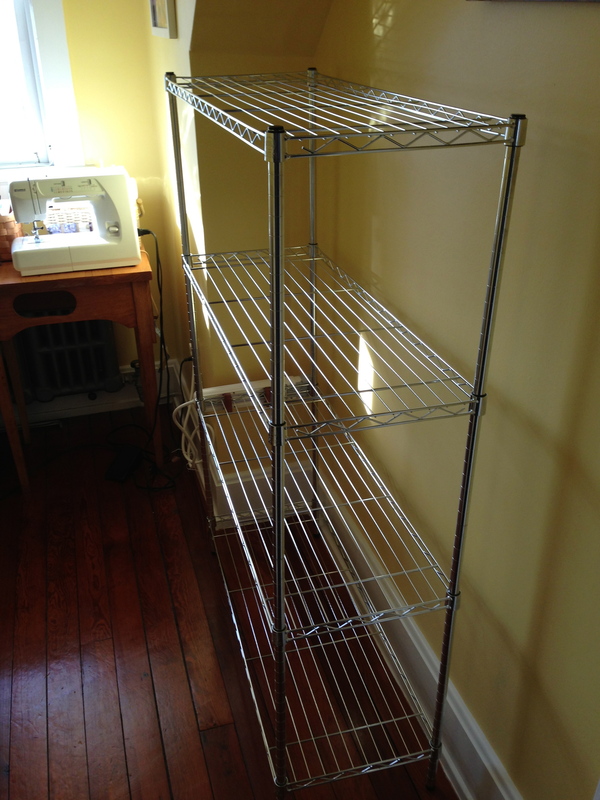 The wire shelf I chose has four shelves and cost $50. The overall size of the shelf is 36 inches wide by 14 inches deep by 54 inches tall. With four shelves I would be able to have three shelves with lights and one for a heat mat. I attached a power strip to the side of the second shelf, with two small wooden blocks. For the lights I chose to use 24 inch fluorescent under cabinet lights. Each light was $9, so for each shelf it was $18 in lights. I connect the lights together with a long strip of wood. Then I attached eye hooks to the wooden strips. I used S-hooks and chains to hang the lights from the shelf above. 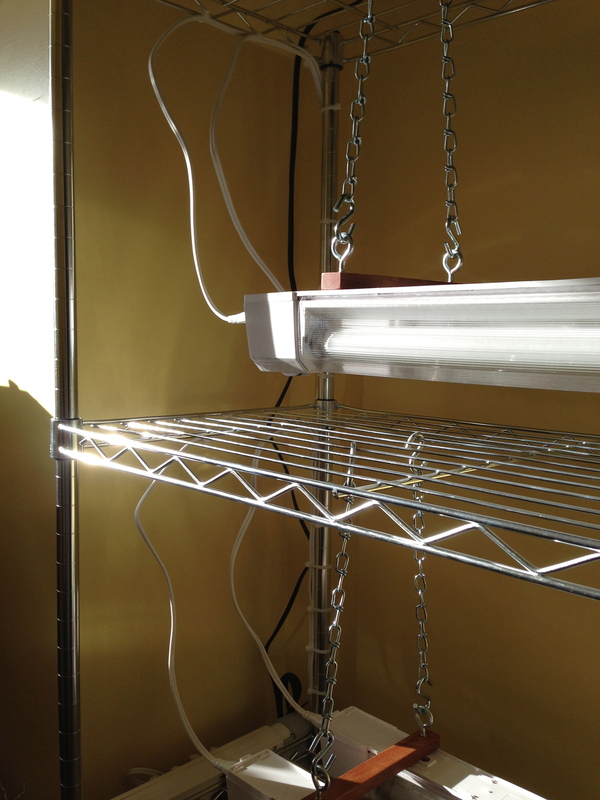 The chain allows me to adjust the height of the lights from the top of the seedling. It is very important to have the ability to adjust the lights over time as the plants grow. I used a lot of wire ties to keep the wires organized and attached to the shelves. 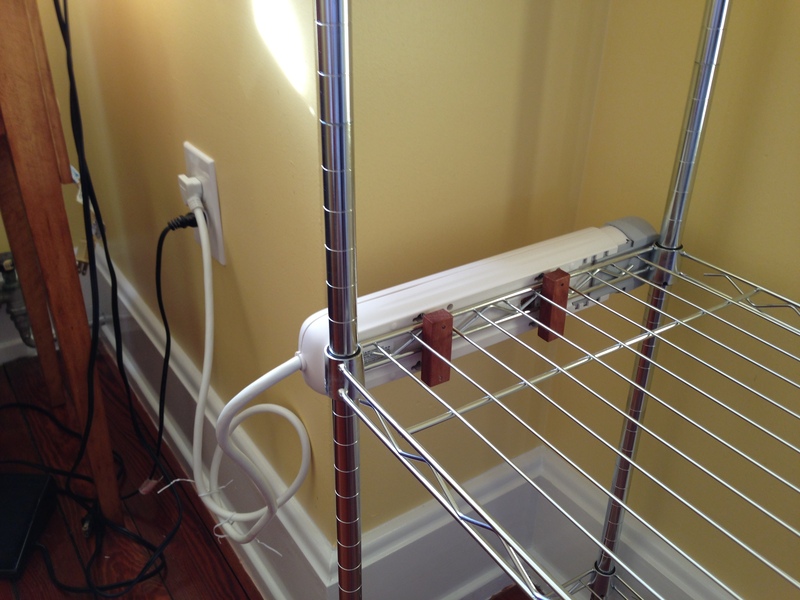 Keeping the wires out-of-the-way will be very helpful when there are lots of trays on the shelves. Lose wires can be dangerous, a few simple wire ties can clean it right up. This simple seed starting stand will allow me to start seeds all season long. It also fits into a little nook in our office/sewing room. – Place your stand in a room that is heated. – I feel it is important to have a good natural light source in the room. – Make sure it is easily accessible any time of day. – Remember the light will be on for about 14 hours a day, so depending on your sleeping habits, you may want the lights to be away from the bedrooms. You may have any early sunrise otherwise. – Make sure the room has a good power source. Seed starting is a lot of fun, so give it a try. In the coming weeks I will continue to post more about my seed starting experiences. This entry was posted in Seed Starting and tagged Backyard gardening, gardening, Homesteading, Organic gardening, Urban Gardening, Vegetable Garden by M Riland. Bookmark the permalink. Really motivaing me to get started with my indoor garden! Great post! I’ve been wanting a better and cheap set-up for my seedlings. Right now (on cold days) they sit on top of my washer and dryer with a single grow light bulb above them. Love your setup. Will have my kids build one for me.